If you’re suffering from a bunion and evaluating your treatment options, a major factor in the decision-making process has to do with recovery time. In fact, many individuals procrastinate and put off surgery for months or even years based upon this consideration, which traditionally could range from six weeks to six months and require plenty of elevation time. Fortunately, there’s a new way to treat bunions that gets you back on your feet much faster – so fast that most patients can actually bear weight on the affected foot the same day as their surgery. Here’s an overview of the cutting-edge bunion correction surgery in NY being offered at Extend Orthopedics by Stuart Katchis, M.D. What is Re+Line® Bunion Correction Surgery? 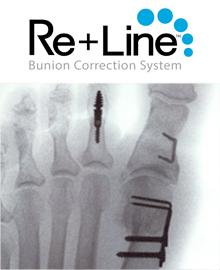 Re+Line Bunion Correction Surgery is a proprietary system that Dr. Katchis helped develop. The Re+Line technology offers more precision and control for foot & ankle surgeons and, best of all, faster recovery times for patients. The procedure repositions and stabilizes the big toe joint using a unique, low profile tension band compression plate. During the surgery, the orthopedic surgeon inserts the proprietary device along the side of the big toe to provide stable fixation of the big toe joint with long-lasting results. The device remains in the foot after the procedure, reducing the chance of recurrence. Because of its low profile design, patients won’t be able to see or feel it. What are the advantages of this bunion correction procedure? Early weight bearing – Most patients can bear weight on the affected foot immediately following surgery. No bulky cast – Patients can wear a firm-soled postoperative shoe instead of a bulky cast. Fast recovery – The procedure allows for a much faster recovery than traditional bunion surgery. Patients are back in shoes within three to four weeks. Stable, long-lasting fixation – The Re+Line device provides stable fixation of the big toe joint with long-lasting results. Reduced chance of recurrence – Recurrence is prevented since the low profile fixation device remains in the foot. How much experience does Stuart Katchis, M.D. have with treating bunions? Orthopedic surgeon Stuart Katchis, M.D. is a leader in treating bunions and performing bunion correction surgeries. As a fellowship-trained physician with expertise in the foot and ankle, Dr. Katchis has been helping patients with bunions get back on their feet pain-free with remarkable results for more than 25 years. In addition to his involvement in cutting-edge product development for treating conditions like bunions and hammertoe, he also serves as Section Chief for Foot and Ankle Orthopedic Surgery at Manhattan’s Lenox Hill Hospital and frequently lectures on foot and ankle surgery topics, including the latest advances in surgical techniques. Looking for bunion surgery in NYC? If you’ve been putting off bunion correction surgery, worried that it will put you off your feet for too long, we invite you to call our office at (212) 434-4920 or fill out the form on this page to schedule a consultation at Extend Orthopedics and learn more about Re+Line. Our practice offers two convenient locations in the New York City area, one on the Upper East Side of Manhattan and one in Scarsdale, NY. Getting your bunion fixed no longer means taking weeks off of work or your normal activities to recover. We get our patients back on their feet immediately after surgery with significantly shortened recovery times.